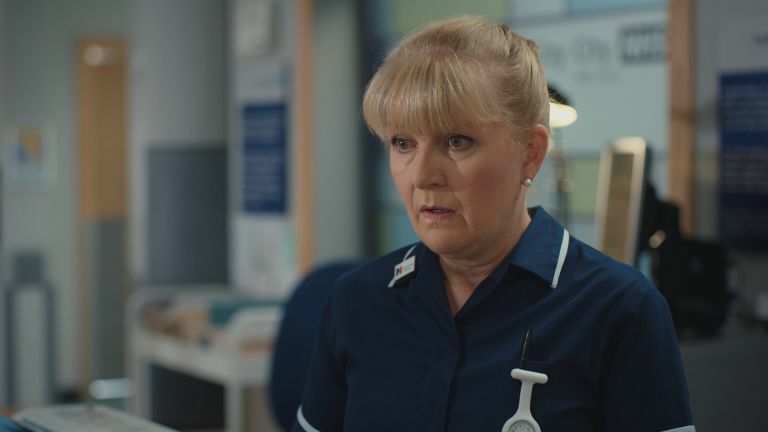 Casualty star Cathy Shipton has warned that viewers will be reaching for the tissues as Charlie and Duffy's story gets even darker. Duffy has been suffering in silence for the last few months, having failed to tell her husband Charlie about her depression diagnosis. With Charlie oblivious to how much his wife is struggling, Duffy will grow even closer to her childhood sweetheart Bill in this Saturday's episode – after an incident at work leaves her devastated. Teasing turbulent time ahead for her character's marriage, Cathy – who plays Duffy – said to Inside Soap: "I can't say too much, of course. But our producer Lucy Raffety has already gone out there to say that both Duffy and Charlie have a challenging time ahead. She added: "For our guest characters, their story is done and dusted in a week. But we're also playing out long-running stories with our long-running characters, and taking the audience along with us. We're not pulling any punches, and I think that's good." 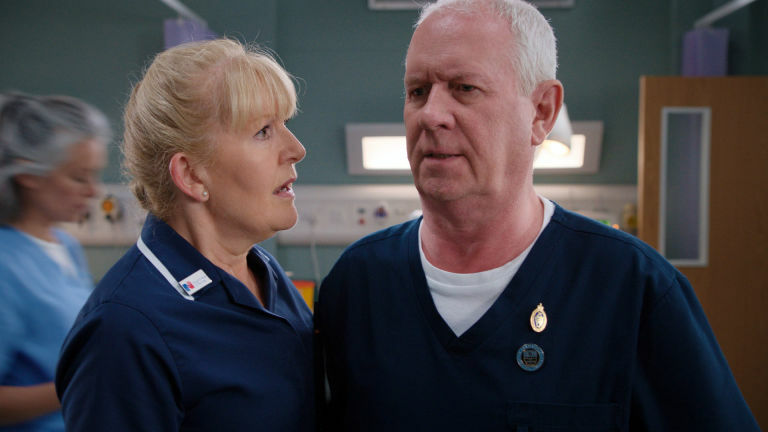 Discussing why Duffy hasn't been able to share her struggles with Charlie, Cathy commented: "I'm sure that people will be shouting at the telly! "There's an element of Duffy that's denying what she's feeling, believing it'll just go away – which is human, and I'm sure a lot of people can relate to that. But it's good to explore. Alas Im struggling to watch this show now and Doctors as the BEEB have employed Norman on his Organ to play insane, unwanted and totally annoying back ground mood music. Didnt they learn from the down fall of ITVs the Bill, all they need to do now is also employ shaky hand Len on the camera and the show will be gone in weeks. Probably replaced with a re run of Friends or worse. Mind you it wasnt just that that killed the Bill, no it was Louise Lytton who I see is now trying to take down EE. Base works for Ross in his meth lab to pay off his debts. He collects 16-year-old Harry to work with them, and watches on as Ross physically asserts his authority over the teenager. Duffy wakes up in a hotel room having slept with Bill. Full of guilt, she sends him away and gets ready to leave. On her way out, she hears a call for help and reluctantly treats Naima, who was found passed out in the hotel swimming pool by her fiance. Is she suffering from dementia?? ?